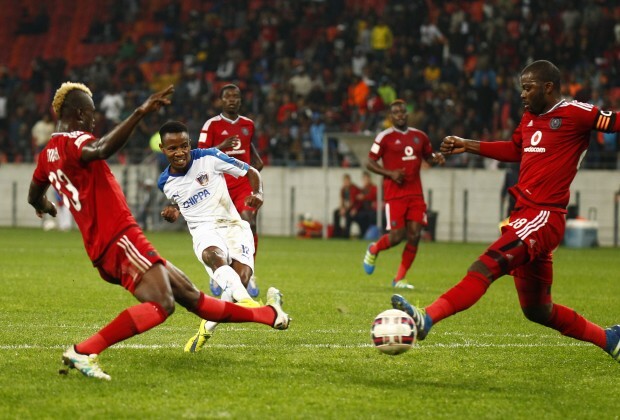 Chippa United jumped above Orlando Pirates on the Absa Premiership table after beating the Buccaneers 2-0 in a league match at the Nelson Mandela Bay Stadium on Wednesday night. The win moved Chippa into sixth place on the table with 42 points, two points ahead of Pirates who suffered their 11thleague loss of the season. The home side, on the other hand, looked full of energy and dominated the exchanges from the first whistle. The opening goal came just before the half hour when some swift passing by Chippa saw Joseph Molangoane break into the box and fired the ball past Brighton Mhlongo, 1-0. Pirates’ only decent scoring opportunity in the entire match came five minutes before the break when a storming run from Ntsikelelo Nyauza down the flank saw him cross for Sifiso Myeni, but he miscued his shot wide from close range. The second half saw the home side continued to dictate the flow of play and they doubled their lead on the hour mark when Buyani Sali turned home a pass from Molangoane, 2-0. Eric Tinkler opted to re-shuffle his pack midway through the second half, as he introduced Thabo Rakhale for Menzi Masuku in the 57th minute, before bringing on Thamsanqa Gabuza later in the half. The last half hour saw Pirates trying to mount pressure, but the Chippa side kept them quite as they picked up all three points. Chippa: 01 Akpeyi, 24 Thopola, 02 Okwuosa, 22 Maponyane, 13 Mthiyane, 42 Mlambo, 45 Zulu (Manzini 75’), 06 Sali, 21 Sangweni(Cloete 89’), 10 Mbenyane (Zuke 58’), 12 Molangoane. Pirates: 18 Mhlongo, 02 Gcaba, 28 Mahamutsa, 05 Makola (Gabuza 74’), 07 Ndoro, 11 Myeni (Sarr 90’), 12 Masalesa, 26 Masuku (Rakhale 57’), 33 Gyimah, 34 Nyauza, 37 Memela.